eD@HoMe: 2 awesome turtles covers! Welcome back! Today, I have 2 awesome turtles covers from India to share with you. Courtesy of Jeevan Jyoti. Thank you very much! 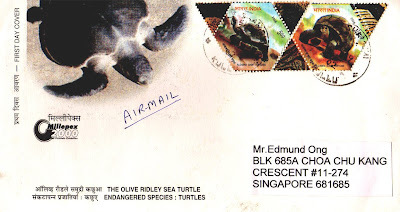 The first cover was franked with a set of stamps from the "Endangered Species" series, issued in 2000. The stamps depict two of the most critically-endangered turtle species; Batagur Terrapin and Olive Ridley Turtle. Many Asian turtles are endangered from over harvesting for their meat and eggs, destruction of nests and feeding areas, and accidental by-catch in fishing operations. Let's save them before it is too late! Next is a lovely cover franked with a set of stamps from the "Aldabra Giant Tortoise" series. It is my second cover featuring these magnificent hexagonal shaped stamps. 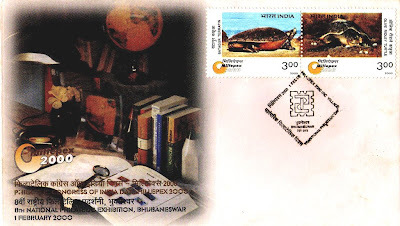 As previously discussed, these stamps were issued on 2nd August 2008 to commemorate Adwaitya, an Aldabra Giant Tortoise who died in Alipore Zoological Garden in Kolkata, India in 2006. He was perhaps the longest living animals in the world having lived for more than 250 years!